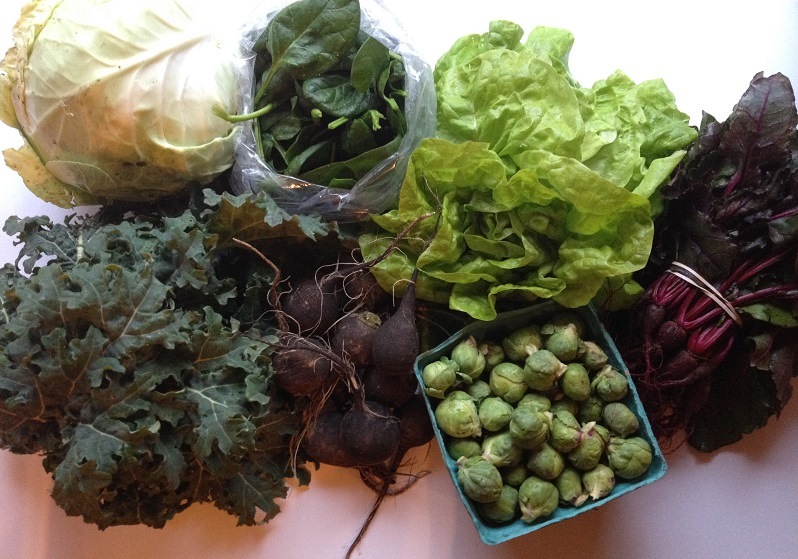 Our winter CSA from In Good Heart Farm began this week. We’ll get a share every other week through mid-March, and boy oh boy was it a good haul. Last week, I roasted beets that I had peeled and chopped into wedges. After they came out of the oven, I tossed them with a balsamic vinaigrette, shaved pecorino cheese, parsley, chives and orange segments, juice and zest. They were delicious. But, they were even better when I piled a bunch of them over chopped avocado. Wowsa. I am having that for lunch again. 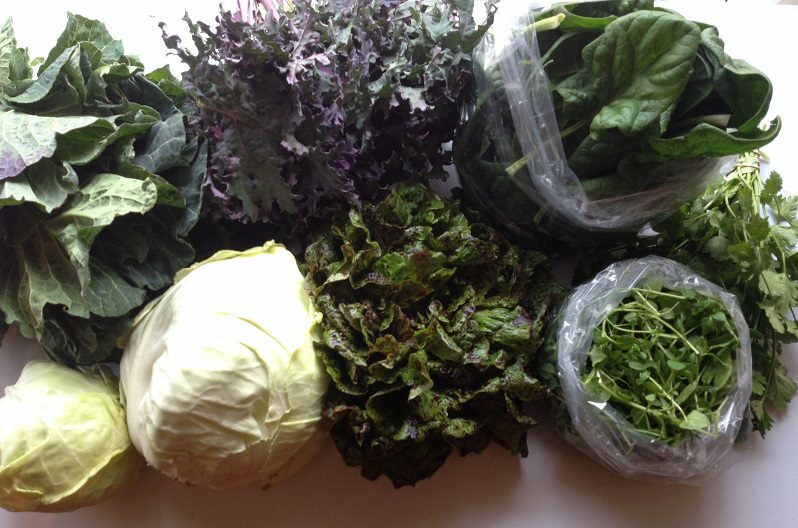 If you still have some veggies left over from last week’s CSA share, check out Deirdre’s ideas for those veggies. They all sound delicious. 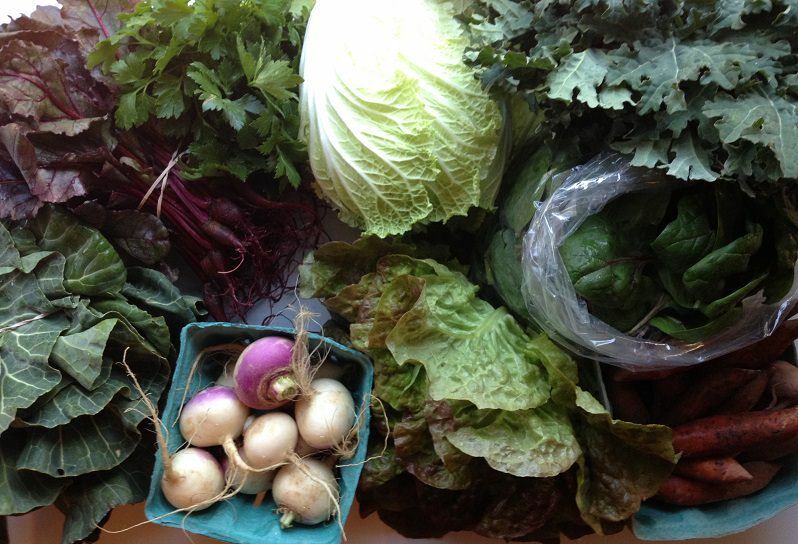 It’s the second week of our winter CSA from In Good Heart Farm. We’re getting a share every other week. Here’s what I’m thinking about doing with our bounty. I haven’t made a Caesar salad with kale in quite a long time and just looking at the photo of the kale and romaine Caesar salad in this two year old blog post of mine is making me hanker for one. If I go in the completely opposite direction, this gnocchi with butternut squash and kale from the Food Network looks pretty darn tasty. Last night I made a variation of my creamed greens with the collards. I added mushroom, onion, red bell pepper, carrot and poblano pepper. They passed the “so-good-I-have-to-blog-about-it” test with flying colors. Stayed tuned for that. Last night, for the second time, I made Braised Chicken and Kale with Paprika and White Wine from Sweet Sugar Bean. This time I made it with boneless, skinless chicken thighs and smoked paprika. Oh yeah, it’s a keeper. Another recipe I love but haven’t made in a while—Sautéed Kale with Beans and Pancetta from Italian Food Forever. I usually use cannellini or Great Northern beans and add slow-roasted grape tomatoes. You could add sausage or fish to make a one-pot dinner. I think this Fish Taco Cabbage Bowl from Kalyn’s Kitchen sounds so refreshing in the midst of winter. We haven’t tried this yet, but you bet we will soon! An irresistible pasta recipe made with chicken sausage, kale, onion, garlic, smoked paprika, thyme and chipotle in a sweet potato “cream” sauce. For the past few years, I’ve resisted massaging kale. But I’m okay with it now. I had my first kale massaging experience thanks to this pasta dish inspired by a recipe from How Sweet It Is. It’s been a big hit in our house. I have to say, I’m surprised because I didn’t think a sweet potato cream sauce would go over well but it did. I knew I would like it, but then how can you not like this combination of flavors – sweet potatoes, sausage and kale. Sounds like a soup I made recently. And a gratin – minus the sausage. Lots of folks tell us they don’t know what to do with radishes. Here’s one yummy way to use them. Seriously. Try it. You’ll love it. A quick Asian-style sauté of black radishes with red bell pepper, garlic, red pepper flakes, cilantro, mirin rice wine and sesame oil — this recipe would work well with other types of radishes too. I was never a big radish fan. Even though we always have radishes in our nightly salad, if Jim didn’t like them so much, I would never think of adding them. I used to always eat them but I could have lived without them. It’s not that they’re bitter—I like bitter flavors, but radishes always left me feeling “meh.” Supermarket radishes, that is. 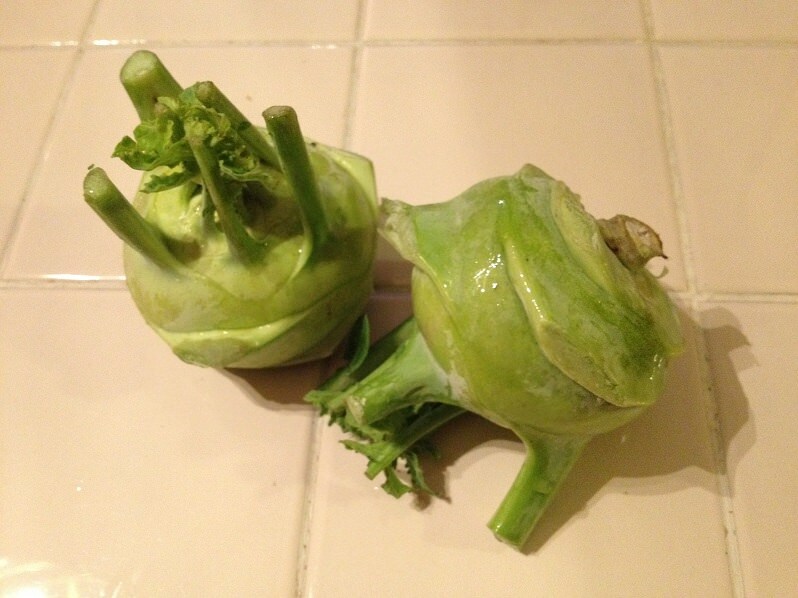 Then we started getting radishes in our CSA share—regular red radishes and watermelon radishes. Now, I got why people like radishes. It was like going from canned sliced black olives (aka washers) to oil-cured Moroccan olives. What a difference. Finally, flavor! And moisture! Ham bone (and ham), beans, sweet potato and greens soup — a big bowl of tasty comfort that’s a perfect recipe for a chilly day or night. Don’t have a ham bone? Sear some slices of ham instead. Mmm mmm good. It all started with a ham bone. As soon as I saw Jim taking a ham out of a grocery bag after Thanksgiving, I claimed the bone. At first, I planned on making Hoppin’ John soup for New Year’s Day. But since New Year’s Day is also Jim’s birthday, I made what he wanted for dinner: corned beef and cabbage. 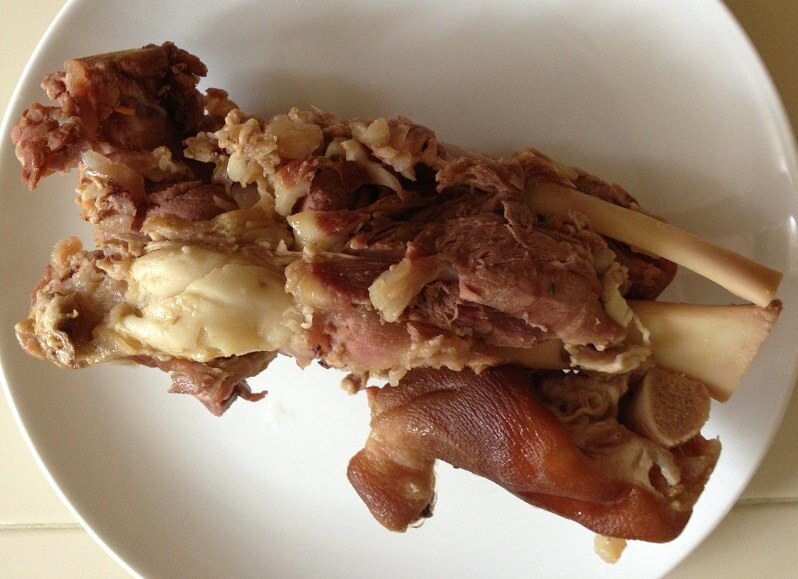 My ham bone after cooking in the soup. What a beauty, huh? Elliott & Grandma taking a break from the dairy. Can you believe it’s Fall already!?!?! Yummy yummy green goodness! I’m so happy to have them all back :). & I’m not tired of peppers or tomatoes or eggplant yet either, so I’m happy for that too. We’ll see you Tuesday (at Five Points 4:30-6:30pm), Wednesday (here at the farm 4-7pm) & Saturday at WWFM (8-noon). Have a fantastic week! P.S. Please send along any recipes you think would utilize these ingredients well & I will share them with everyone. I will also work on finding some good ones for you for some of these items. & those of you who are newbies, don’t worry. I’ll be at the pick up sites to talk about these items & what you can do with them. I know you may not have heard of some of these things, much less have cooked them before. ​Elliott loves cows, as lots of you know. He seriously woke up one morning & said “Moo” before he even opened his eyes. When I asked, “What did you say?” He replied with, “Go see cows!” This kid.